Welcome to Nemaco Technology's reference section that provides technical information for type of NEMA enclosure. Nemaco has dedicated a technical section for NEMA 12 enclosures. This technical reference section provides the basic NEMA enclosure rating & definition, common sheet metal materials, mechanical hardware, paint coatings, environmental seals, miscellaneous parts and electrical accessories (if applicable). 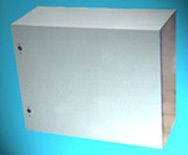 And Nemaco has provided a typical NEMA 12 enclosure examples (shown in the photos) for our customers. The top photo shows a NEMA 12 enclosure with the front door and two quarter turn latches available from Nemaco. The next photo (below) shows the door open with continuous seals inside the enclosure door. The front edges of the NEMA 12 enclosures required good seal to keep out dust and to be water resistance (to dripping water from a pipe, if applicable). Nemaco uses proven enclosure designs that eliminate most of the office dust and factory dust from getting on electronics. Also, Nemaco fabricates most NEMA 12 enclosures from carbon steel materials (i.e., sheet metal, hinges) and then powder coats entire enclosure surfaces uniformly. After the power coating is cured and dry, then Nemaco will get the other remaining parts (foam seals, handles, latches, etc.) assembled and completed for a quality NEMA 12 enclosure. By the way, Nemaco can offer customers a spectrum of powder coat & paint colors including the super Tigerbox™ orange. And after the NEMA 12 enclosure is completed and packaged properly, then Nemaco will have the enclosure shipped per the customer's preferred freight company. All Nemaco Technology's NEMA 12 enclosure and cabinet products are available with the following options: adjustable rack rails, clear lexan windows, temperature controlled AC cooling, double doors, grounding studs, padlock provisions, sub-panels (powder coated carbon steel & aluminum), single shelf, adjustable shelves, custom cut-outs and many custom colors (light computer gray, industrial gray, royal blue, sunny orange, super black magic, etc).